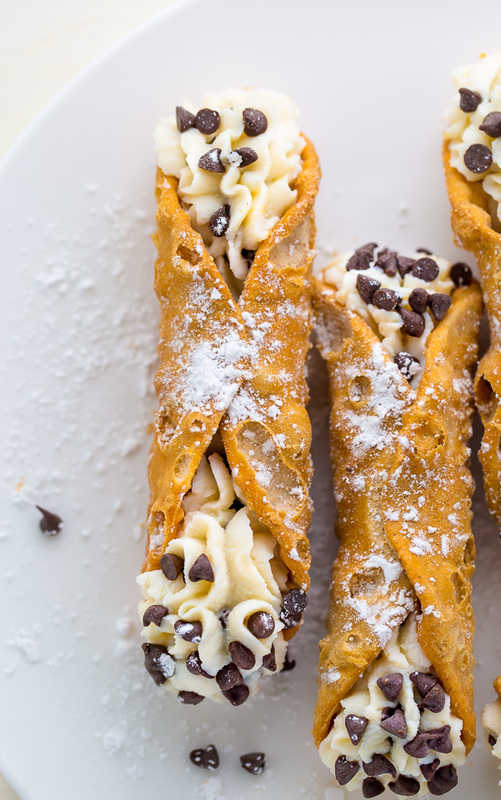 An easy and delicious 5-Ingredient Cannoli Recipe! This classic Italian dessert is so delicious and always a crowd-pleaser. 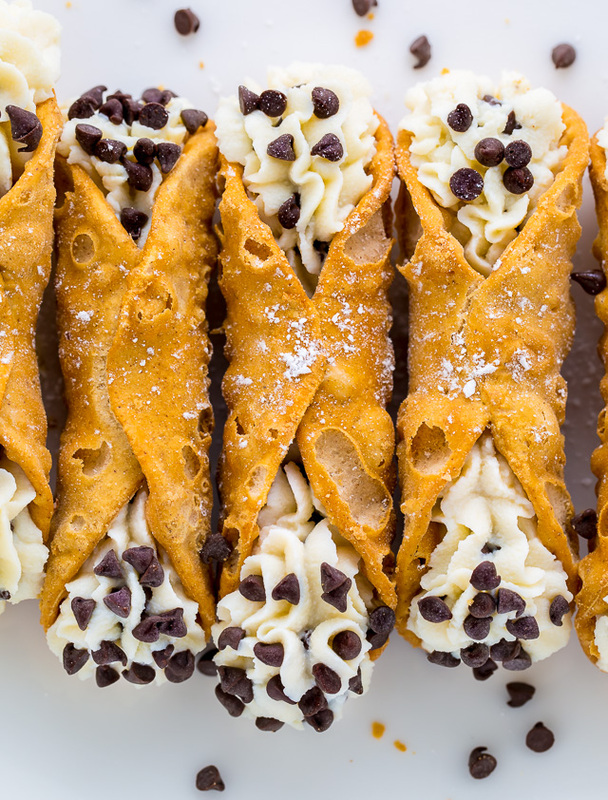 So if you’ve been searching for a foolproof recipe for cannoli filling, this one’s for you! I woke up the other day and realized something terrible… I’ve never shared with you my mega simple recipe for 5-Ingredient Cannolis with you! So many recipes… so little time! But I really wanted to squeeze this one in before the holidays. So I dropped everything, walked to the store (I don’t drive… did you know that? ), grabbed my ingredients, and got busy. Lucky for us, this impressive recipe is sneaky simple. I’m talking 15 minutes of active work simple. Italian Cannoli is a form of pastry that originated on the Island of Sicily. Most cannoli consist of tube-shaped shells of deep fried pastry dough that are then filled with a slightly sweet and creamy filling, that’s usually made from ricotta cheese. Every time I make this recipe I get a little nostalgic. My grandmother taught me how to make cannoli many moons ago and the memory is one of my favorites. 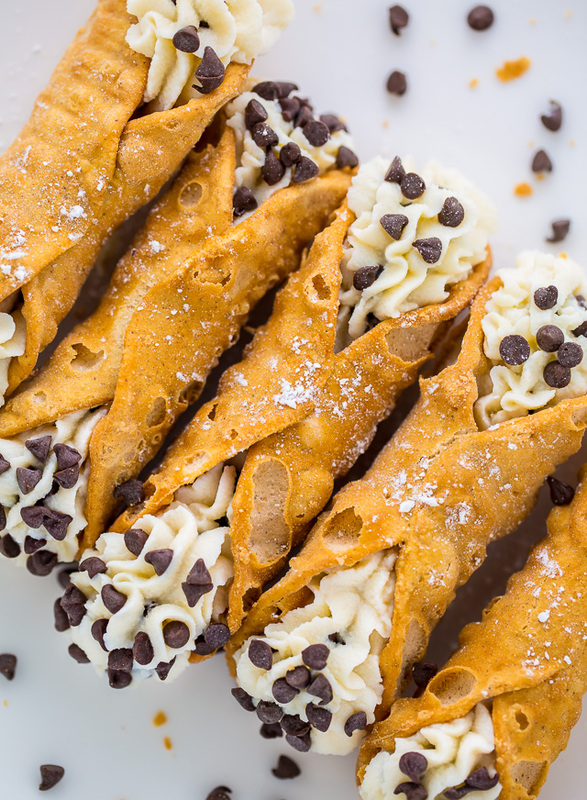 I must confess my gran made her cannoli shells from scratch (and man were they good), but most days I just don’t have time for that so I buy them from our local pastry shop or the grocery store. One day I’ll get it together and post her cannoli shell recipe too, but for now, feel free to use store bought shells or make your own using your favorite recipe. The most important part of this cannoli recipe is draining your ricotta cheese. It MUST drain. At least 12 hours, preferably overnight. If you use it as is, your cannoli cream filling will be wet and grainy and make your shells soggy. To drain, you’ll want to place the cheese in a fine mesh strainer and cover it with a piece of saran wrap. Place some pie weights (or just dry beans) on top of the saran wrap and place the strainer over a bowl. Pop the bowl in the fridge until needed. You’ll be surprised to see how much liquid comes out! As mentioned earlier, I used store bought cannoli shells. Bellino cannoli shells are very good and what I use if my local pastry shop is out of fresh ones. 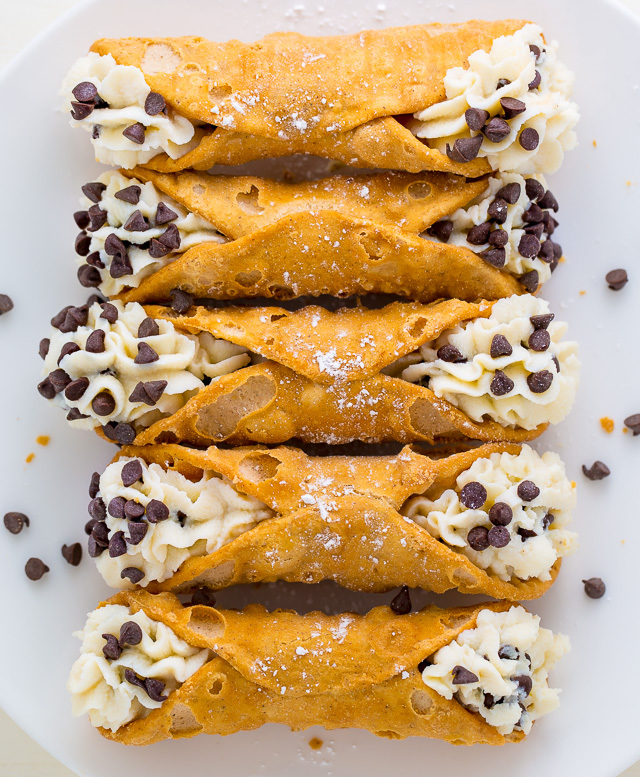 You can also make and use your favorite homemade cannoli shell recipe. 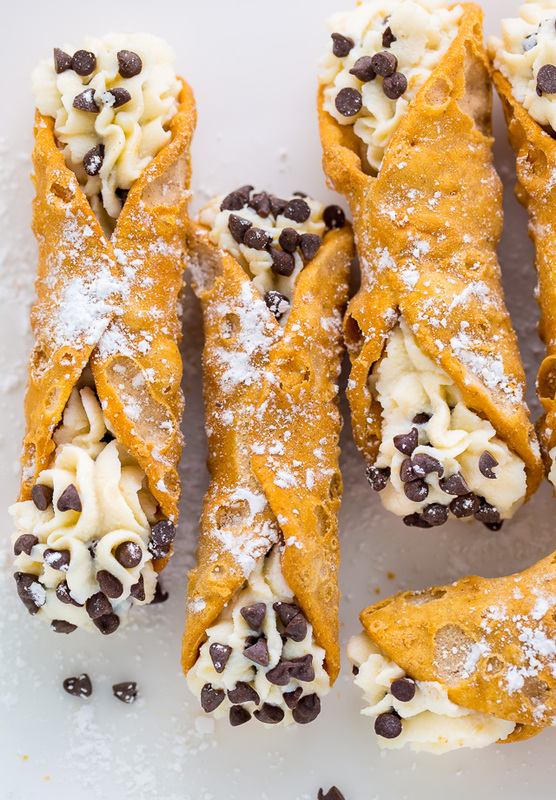 Although I prefer a simple cannoli with just a dash of vanilla extract, feel free to make these your own! Add in orange zest, chopped pistachios, or even sprinkles! Just be sure not to make the filling too chunky if you plan on piping it into the shells. If you can’t find mini chocolate chips at your local grocery store, you can click here to buy them online. In a large bowl combine the drained ricotta cheese, confectioners' sugar, 1/4 cup of the mini chocolate chips, vanilla extract, and orange zest (if using); mix well. Using a spatula, carefully scrape the mixture into pastry bag fitted with a 1/2 inch open tip. Use at once, or refrigerate until needed; filling can be made up to 24 hours in advance. When ready to serve, pipe the filling into one end of cannoli shell, filling shell halfway, then pipe into other end. If you don't have a piping bag, you may spoon the filling into the shells. Repeat with remaining shells. Place remaining mini chocolate chips on a small plate. 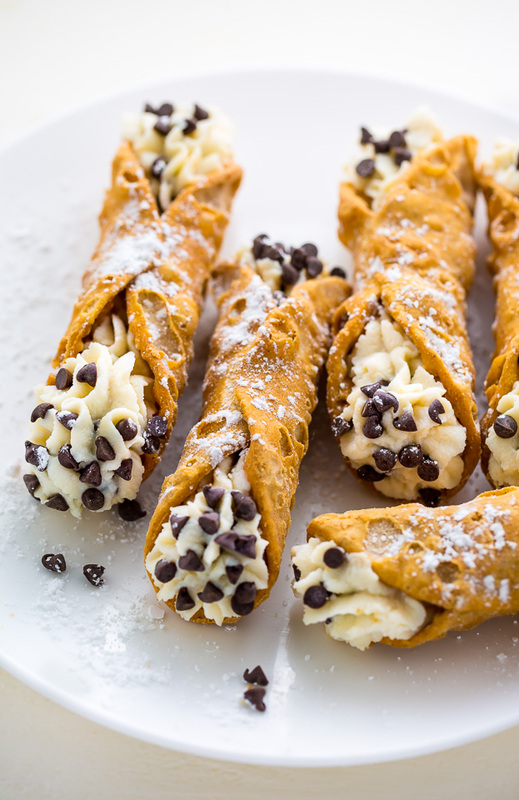 Dip each end of the cannoli into the chocolate chips, then lightly dust with confectioner's sugar. Serve at once. oh my gosh my husband would LOVE these ! O! A family recently opened an authentic Italian restaurant in our dinky little town and I went in to buy desserts, cannoli for my son and tiramisu for me. OMG!! Did I mention our town was very small and the only place that has fabric table cloths and a hostess is the Italian place? Son loved the cannoli, I’m strictly a tiramisu person. I ordered cannoli molds off Amazon and making shells will be easy with my waffle iron. I prefer the cannoli filling as a dip with broken waffle cones as scoops. Homemade cannolis are the best! I need to make these! *gasp* I have never made cannoli and that is a travesty. This recipe is going to change all that! How long can any extra filling be stored for in the refrigerator? Just found this and can’t wait to make these. My ex MIL made these and your picture looks exactly like hers. Made me miss some old times. My daughter and I plan on making your cannoli filling soon, can we use Whole milk Ricotta? Wondered if there was a way to make them more WW friendly- lowfat ricotta? These look wonderful! Any suggestions how I could make them WW friendly? Thanks! You can also use the cannoli as a dip. At a local bakery, they sell the chips and also cannoli shells. But you can also use graham crackers, pretzels or at another grocery store, they have cinnamon and sugar chips that also goes good with them. Quick and easy and a great dessert. NEVER MADE RICOTTA CREAM, MY FAMILY DON’T LIKE IT. MADE CREAM ONLY, RECIPE CAME FROM THE BACK OF CREAM CORNSTARCH BOX, IT NO LONGER IS PRINTED ON THE BOX. Hi, I am Italian and with the holidays just passing I just got done making Anginetti cookies, Ricotta cookies and Cannoli Cheesecake. With all the baking I have done over the years I have never made Cannoli’s. I have eaten many, many, many Cannoli’s. You’re recipe for the Cannoli cream looks delicous and I am going to try it and I will let you know how they came out. Today I just ordered the Cannoli forms and will received them on January 15th so on the 16th I will make them. I will let you know. Thank you for the recipe. HI Rosemarie, I too am Italian and make Ricotta cookies, cannoli cookies, stuffoli and biscotti cookies during Christmas. I have eaten many cannolis but have never made them either. What did you think of this recipe as I’m looking to make some this year for Christmas. I have a nut allergy so I can rarely eat goods from bakeries like cannolis. I’m so happy you published this – I made these with my mom and she said they tasted like authentic Italian cannolis!! Thank you! $42.99 for Bellino Cannoli Shells, 3 oz (Pack of 6)? Right? Any other recommended brands? Golden Cannoli shells are really good. Lots of information on their website. Can I use your cannoli cream for the filling when I make my Cassata cake. We are Italian American and love both of these desserts. I have made Cannoli in the past, but never Cassata cake. Do you think your cream would be a good substitute ? your cream sounds delicious did you ever post it, I need to make a conilli cake and canollies for Christmas , we are Italian also. Do you have the Nutritional Facts for this recipe? I want to make it for a class, but have to have that information to be able to bring it in for this project. Thanks! Oh man! I could really sink my teeth into that! Can i use this recipe as a cupcake frosting? Hi, can I use cream cheese instead of ricotta? I like to use shaved chocolate instead of chips. I will also add finely chopped candied fruit, and finely chopped pistachio nuts. Hi! I was a pastry chef for years, at a local italian restaurant. If you can get your hands on Impastata Ricotta cheese , you will not need to drain. Plus, its rich , creamy & dreamy! Also, can substitute a half of a teaspoon of lemon extract, for the vanilla! These sold out daily! Thanks! I have had lots of success with this recipe. in doing so, I also found that I can use ice cream cones instead of cannoli shells which gives it a unique look. it is also important to add the chocolate chips last or when you’re mixing it, they will go flying all over the place. Love the recipe SOOO much!! Yay! So happy to hear that, Addison! This looks absolutely delicious!!! Yum! I’ll have a slice now please!